As I write, there is a new and vibrant platform that acts as a marketplace to connect SMEs that require financing and investors who are seeking for high yielding investment vehicles in Malaysia. The platform is commonly known as peer-to-peer (P2P) financing. In 2016, the Securities Commission (SC) has announced the P2P financing’s regulatory framework and has approved six P2P operators in Malaysia. One of them is Funding Societies. Personally, I’ve explored its facilities, registered an account and began investing. Thus, I’ll be sharing my personal experience and what I know thus far about investing via Funding Societies. 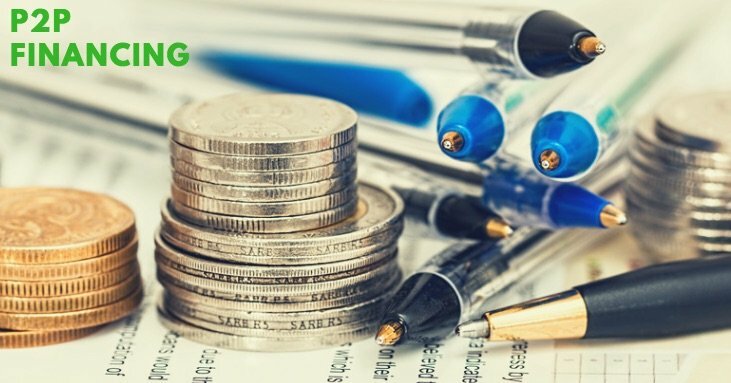 Therefore, here are the seven things you need to know about Funding Societies before you invest. Funding Societies was launched in February 2017 as the first P2P operator in Malaysia. Presently, it is also the largest P2P operator in our nation. Since its launch, Funding Societies has crowdfunded RM 310.8 million regionally (Malaysia, Singapore an Indonesia). For local SMEs in Malaysia as of December 2017, they had successfully funded RM18 million so far. #2: What can Investors buy? #3: How Much am I making? #4: What is my Risk? As I’m a financing provider (like a banker), I would face the risk of potential loan defaults and late payments. As at December 2017, Funding Societies has reported a default rate of 1.4%, which in my opinion is very good. This low default rate is based on the track record of their Singapore HQ. In their few months operation here in Malaysia, there is zero default so far. #5: How Much can I invest? First and foremost, you may need to deposit RM 1,000 into your brand new account. From which, you can start investing with as little as RM 100. The maximum amount is capped at RM 50,000 per investment. #6: How do I track my Portfolio? I’m able to track my investment portfolio with ease in my account. #7: How do I open my Account? Disclosure: It is my affiliate link. When you sign up using this link and invest RM1000 successfully, we will both be credited with extra RM30 for investment. 24 replies to "7 Things You Need to Know about Funding Societies before You Invest"
I tried to calculate your effective annual return (19.26%) by assuming it’s compounded monthly, but I could not get your 19.26%. May I know what assumptions do you use in computing it? Hi, after invest. 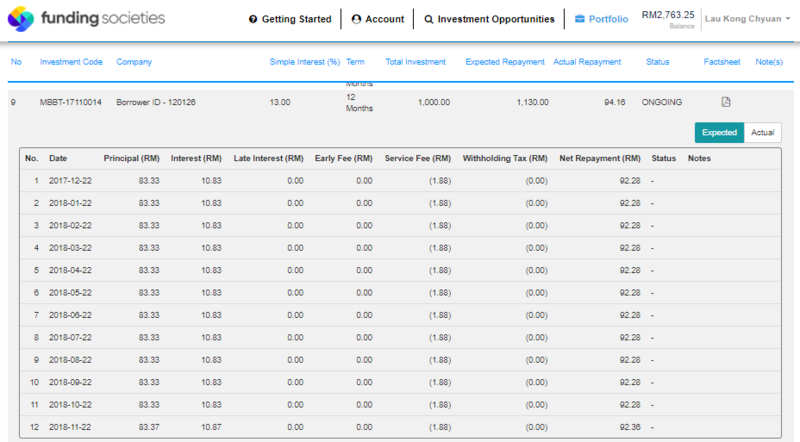 The status of my investment is ‘pending investment’, which mean I success my investment or? Thanks. It means it is in progress.. not yet released to the borrower. May I ask if I have reached investment of the maximum capped RM50k, should I open a second account? Or Is there other similar p2p like funding societies? used ur referral link. thanks KC. How about other P2P companies like Finpal and Fundzatic ? Are you are able to compare them as well? Just to know if the borrower default, then how will be my investment eg. 1000? 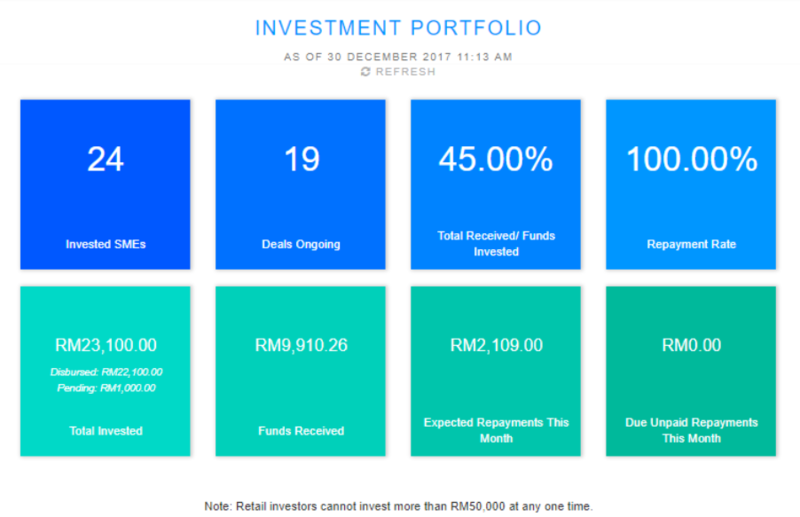 Signed up using your affiliate link and successfully invested RM1000 and now RM1100 has been invested in the deals but RM50 is nowhere to be seen. Anyway, already asked them via live chat. Pending their reply. I am not sure though. You will need to ask Funding Societies to confirm. Hi, I’ve signed up about a week ago and my account just got verified after the payment was made, when would the RM50 referral fee be credited into my account? 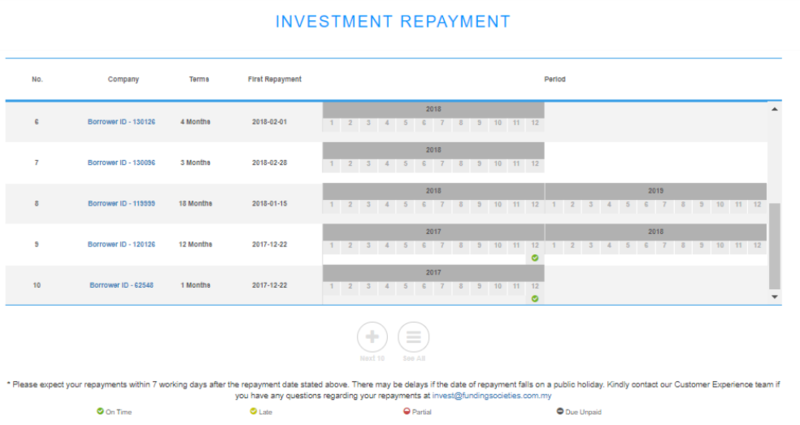 registration just approved and noticed no more investment opportunities available, currently also only one ongoing investment deal right now.. curious if this still valid..
Now the supply of lenders is more than borrowers. As a beginner on investing, I have been reading few of your articles. Thanks for sharing, I’ll be using your link to sign up. how about the defaults cases? how to resolve? please provide some example (if any). for Malaysian, is the interest profit subject to tax? or GST? or income tax? So far, there is no default yet for the companies funded through FS Malaysia. The interest profit is taxable. And you need to declare to IRB using the yearly statement FS email to you. Is it then really worth it if the interest profit is being taxed? After taxed, it is still giving the rate of return you require? It differs for each person, depending on their tax bracket and also the expected return rate. I think the tax is the deal breaker. Here is my reasoning : Assuming u get net 9%+ interest. If you tax bracket is 20%+, that will leave u with only 7%+. Better put it in EPF or ASM etc which give almost similar return but is virtually risk free. can i withdraw all my money if i didnt interested anymore in investing. You can withdraw the balance anytime. But for the sum that participated in deal, you will need to wait for the payback period to get it back. Hi KCLau, thanks for your post. i would be registering using your link. Just want to ask, do you know if foreigners are allowed to invest as well. Try opening an account with them. No harm trying. I think foreigners are allowed. Just got withholding tax. wow thank you so much kc for this sharing!